Vous allez adorer rester dans cette belle maison, peinte avec des couleurs fraîches et lumineuses. La cuisine a été mis à jour w / nouveaux comptoirs en granit et de nouveaux appareils en acier inoxydable haut de gamme. Les salles de bains ont mis à niveau les vanités, les appareils et les comptoirs en granit. D'autres mises à niveau comprennent les meubles de salon, les planchers et la literie. Il y a une piscine privée (12x24), avec d'énormes téléviseurs à écran plat HD (avec chaînes premium), des chargeurs USB et Apple dans toutes les chambres et un barbecue au gaz. L'accès à la plage est juste en face de la rue et il ya de grandes vues sur l'océan de la maison et enrouler autour de porche! Cette maison est également pet friendly et dispose d'un ascenseur qui dessert tous les étages! Parce que la maison est située dans le lotissement du Sud Creek Acres du Sud Nags Head, vous serez traités à des plages immaculées ainsi que des courts de tennis de la communauté et une piscine communautaire. Ne tardez pas à réserver vos vacances en famille dans cette maison avant semi-marin étonnant avec tous les extras! Ground Level: Parking pour 4, basket-ball, douche extérieure, piscine privée (12x24), station de nettoyage du poisson, l'entrée couverte. Mid Level: King Master Bedroom (douche debout), 32 "HD TV / DVD / CD combo, Chambre King w / d'accès du pont, 32." HD TV / DVD / combo CD, Chambre w / (2) lits superposés, 2 haricot chaises sac, 47 "HD TV w / Stéréo / Blu-ray / DVD combo. En plein bain Hall (w / baignoire). Top Level: Great Room w / 55 "HD / TV à écran LCD et 2. système sonore 1 surround w / Blu Ray / DVD / CD lecteur combo et accès terrasse, Private Hot Tub (donnant sur l'estuaire Hatteras), actualisée cuisine, table de salle à manger , Great Ocean Views, Master King Chambre (douche debout) w / 32 "HD / TV / DVD / CD Combo. We had a great time here. The property was clean and comfortable. Thank you so much for reviewing our home! We're so glad you enjoyed your stay! Come back and see us again! This was our first stay in OBX. The house was clean, nicely updated, and right across the street from the beach access. The only thing that wasn't clean upon arrival was the outdoor grille, but we cleaned it up nicely and left it ready for the next family to use. We also experienced issues with the second floor AC unit. The rental company sent a repair man over within a reasonable amount of time. The AC fan broke and a part had to be ordered. The rental company offered to install window units if it couldn't be fixed by the second night. It was fixed, and the AC company they used worked fast and quietly in the house. Lastly, the house was ready an hour before our anticipated arrival time, and we were granted access. I recommended this house to friends and family, and we are considering staying there again next summer. Great vacation! Wonderful property. Great design, well maintained and great beach access. Loved the property! Great design with the open living space on the main floor and perfect set up for our daughter, son-in-law and 3 grand kids on the second floor. We lIked the new Look with the dark blue exterior paint. Tastefully decorated, kept fresh and well equipped. Really appreciated the elevator to take luggage etc. to 2nd and 3rd levels. The pool and surrounding area inside the fence was excellent for family enjoyment. Made full use of the grill. And enjoyed an occasional visit of deer in the back yard beyond the fenced area. Also enjoyed the front deck at night. Comfortable place for a few beverages and watching the moon rise over the ocean. Location and access to beach fantastic. We carry a heavy load on our carts etc and it was an easy and short pull to the ocean. If we decide to stay in this area would definitely prioritize Swept Away! Thank you! Thank you so much for taking the time to review your stay! We're so glad you loved the home! Please come back and see us again! The property is amazing. Owners have done a wonderful job with the updates. 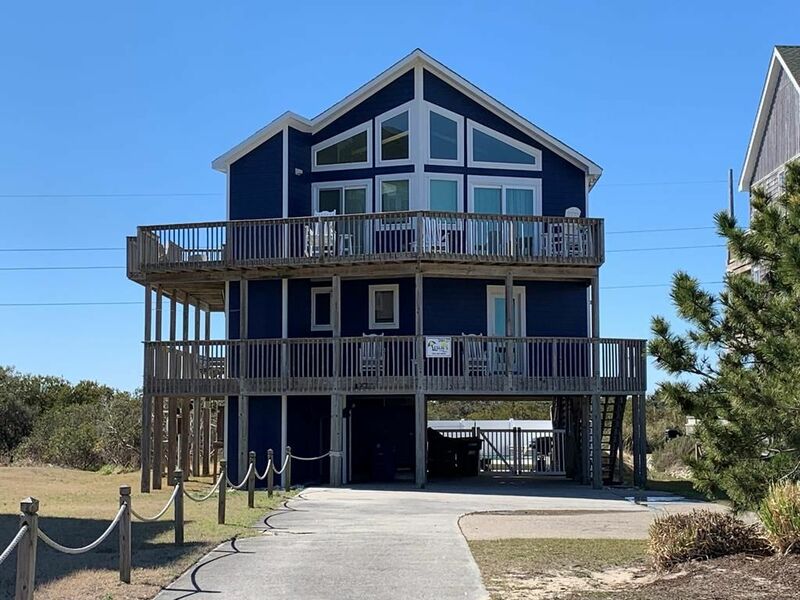 It's convenient to the beach and in a great location in South Nags Head. We thoroughly enjoyed our stay at Swept Away and will definitely return. Beautiful beach home that was clean and comfortable! Short walk to the beach access and wonderful views. The front decks offer ocean views and beautiful sunrises. From the side deck you can enjoy sunsets and the wild life of Pea Island (deer, bunnies and shore birds) as there are no homes behind you. The pool was wonderful on those days when it was really hot at the beach. The kitchen was well equipped for cooking great seafood dinners. Would love to stay there again! Thank you so much for taking the time to write a review! We're so glad you enjoyed the home, its location and all of the amenities! Please come back and see us again!